Important information becomes clear to those with disabilities through the use of realistic representations, all stored on a portable device, and made available online. Contract, manuals, and other important documents can be difficult for anyone to understand. For those with developmental disabilities, these printed materials cannot only be frustrating to read, but can also prohibit those with disabilities from gaining the vital information they need. Symbols for Life™ is a collection of images used to help make important documents easier to understand. A group of skilled photographers, graphic designers, and live models developed this photo series. Now that the images were created, Symbols for Life™ needed a platform to advertise and sell its product. With over 2,500 images specifically designed to act as symbols related to key elements of peoples’ lives, Symbols for Life™ needed an efficient way to offer these images to organizations that could put them to good use. Dynamic Digital Advertising (DDA) would not only provide a mobile solution, but custom website design and development for an online destination where companies can learn more about the tool. 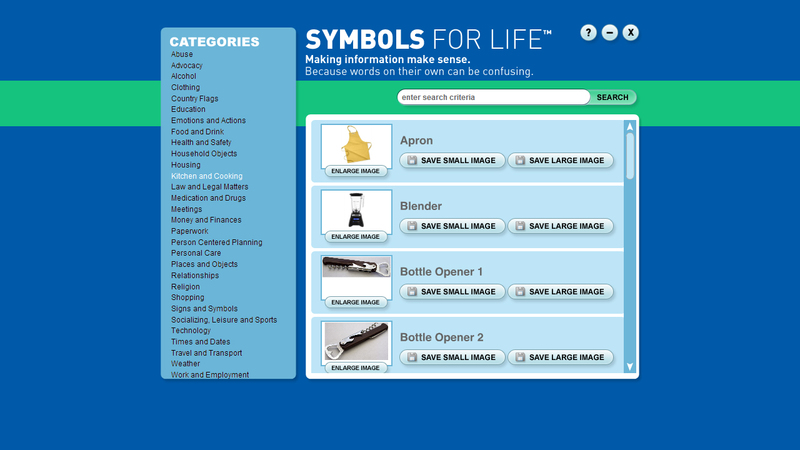 An eCommerce shopping cart would also be included for visitors to purchase the Symbols for Life™ tool. The website design and development team at DDA compiled all of the Symbols for Life™ images into a USB flash drive that users can plug into their computers, upload the image they desire, and add it to their current project. DDA also created an informational website detailing how to use the symbols as part of a variety of sources, such as websites, newsletters, and contracts, thus making these applications easier to read for people with developmental disabilities. By incorporating some of the Symbols for Life™ graphics within the informational site’s design, DDA designers made the website just as easy to follow as the program itself. DDA also programmed an eCommerce site where visitors can purchase the Symbols for Life™ USB drive. Once purchased, each symbol can be downloaded and incorporated into any project that needs easy-to-read and accessible information to maximize clarity and increase independence for people with disabilities. There is now a resourceful tool for anyone to use when wanting to empower those with disabilities in becoming more independent when it comes to understanding important information.